You leave work at 3 am yet again, glumly thinking I’m going to become another karoshi statistic. The nearest capsule hotel is just a half-hour walk away, but you’re super tired and you know a shortcut: straight through an unlit park. 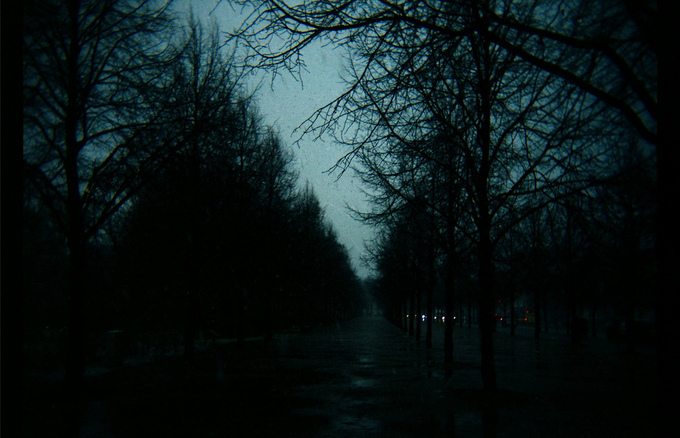 It’s dark and you can barely see past your own nose, but you also know this park like the back of your hand. So off you go, stepping on the grass in brazen disregard of the rules, when suddenly you walk into a wall. Literally. What? Did they put in a new block of toilets? You try to go around it, first left, then right. But the wall seems to go on forever: after walking along the wall for a good five minutes you’re drenched in cold sweat and beginning to think you’re losing your mind. You wearily lean against the wall and light up a cigarette to calm your frazzled nerves. I’m just tired and starting to imagine things, you think. The city council’s in debt; maybe they sold half the park to some rich eccentric. Just as your hands stop shaking, the wall behind you disappears – you’re on the ground, on your back, looking up at the stars. Well and truly freaked out now, you dash through the park in record time, slowing down only when you round the corner and the capsule hotel’s lights come into view. What the hell just happened?! You, my friend, just got punk’d by a nurikabe 塗壁（）, a ghostly plaster wall. The nurikabe is just one of Japan’s many youkai 妖怪（）, the otherworldly apparitions of Japanese folklore. It is representative of the coastal areas of Fukuoka, almost always invisible, and as I’ve hinted at, really enjoys taking the mickey out of nighttime travelers. There is some debate as to whether nurikabe is even a youkai in and of itself. For example, references to nurikabe in the historical records of Fukuoka’s Oita prefecture place the blame squarely on tanuki – or more specifically, on the tanuki’s super-stretchy scrotum – for the wall that appears out of nowhere to block a traveler’s path. Oita also has a folktale where a tanuki stands on a traveler’s obi knot and covers the traveler’s eyes with its paws – hence the “invisible” wall. For the sake of argument, though, let’s assume the nurikabe is a separate being. There are several variants, although their modus operandi is always to obstruct or impede someone’s path. Generally, a nurikabe will disappear if you hit its nether regions; in contrast, the nobusuma 野襖（） variant is a Japanese sliding door that disappears if you just sit a spell and have a smoke. The nuribou ヌリボウ（）, yet another variant, is specific to mountain roads, and grows out of the mountainside at night. Some people claim to have seen nurikabe too: regular folks as well as celebrities. Shigeru Mizuki, one of Japan’s great mangakas, was a soldier in Papua New Guinea during WWII. Following an enemy attack, he became separated from the rest his company. While alone in the jungle, something like a wall of hardened coal tar suddenly appeared. Attempts to sidestep it were futile; the wall quickly grew to encircle him. Tired and confused, he stopped to rest – and the wall spontaneously disappeared. More recently, in 2005 the medium Yuuko Sou visited the infamous Aokigahara to film a segment for the “Youkai Kids” (妖怪キッズ) TV program. She and the TV crew were just about to enter the forest when a blurry, wall-like thing allegedly rose from the ground, as if the spirits of the dead had come together to say, No further! If you’ve come to commit suicide, you can’t enter! The veracity of these real-life stories aside (hey, who am I to judge? ), how and why did the nurikabe legend start? Nurikabe was first depicted in a painting by Tourin Kanou in 1802, and was first mentioned in literature in 1938, in a bulletin published by the Folklore Society of Japan (Nihon Minzoku Gakkai 日本（） 民俗（） 学会（）). However, neither offered much information on the origins of nurikabe. 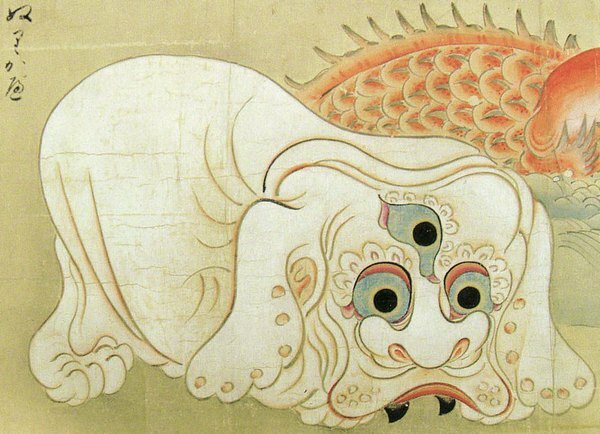 A similar creature is seen in a scroll painting at Kawasaki Museum, but no-one knew what it was – until the above painting, fortuitously annotated with a name, was found in a library at Utah’s Brigham Young University in 2007. Some say nurikabe was just a story created to explain the delay or non-arrival of travelers. Others claim that nurikabe are merely reflections in puddles, amplified by the flickering firelight from the kagari-bi 篝火（） lanterns used during the Edo period. Another theory, which I personally think is the most credible, was put forward by Bintarou Yamaguchi, a novelist, manga writer, and youkai scholar. Yamaguchi-san theorized that nurikabe came about during the Edo period, when the craftsmen of Usuki city in Oita became especially known for their skill in making the increasingly popular, water-resistant plaster walls. Meanwhile, polished white rice was fast becoming a staple in lieu of brown rice. This meant that the poor, who often had nothing but rice to eat, were severely lacking in vitamins A and B1 – hello night blindness and beri-beri! Beri-beri is an unfortunate ailment of the nervous system, whose symptoms include extreme lethargy and fatigue – every step forward is a mission. Night blindness is basically just that: it’s very difficult or impossible for those affected to see in relatively low light. Together, these two afflictions plus some imagination perfectly describe the nurikabe phenomenon: nighttime travelers figuratively hitting a wall they cannot see. The manga GeGeGe no Kitarou (ゲゲゲの鬼太郎) or Hakaba Kitarou (墓場鬼太郎, “Kitarou of the Graveyard”) is a Japanese classic, and was the brainchild of Mizuki-sensei, whom I mentioned earlier. He is much-feted in his hometown of Sakaiminato, where there is a museum dedicated to him, and bronze statues of the GeGeGe no Kitaro characters, including one of nurikabe, line Mizuki Road. The manga has been adapted into several anime and live action versions which include nurikabe as one of Kitarou’s cronies. Did you spot the nurikabe family around 0:33, 0:40, and 0:48? Thanks to the popularity of GeGeGe no Kitarou, nurikabe went from being relatively unknown to being a youkai celebrity. This also meant that Mizuki-sensei singlehandedly (literally – he lost his left arm during the war) determined how the whole of Japan now visualizes nurikabe: as a sleepy-eyed, wall-like creature with stubby arms and legs. Note how different the contemporary interpretation of nurikabe is compared to Kanou-sensei’s version! Nurikabe has also loaned its name to the binary determination puzzle created by Lenin (れーにん), where the goal is to determine the location of each “wall.” I haven’t had the time to have a go at it myself, but at first glance it seems like a hybrid of nonograms and Minesweeper. The dots represent cells that are known to be white, and the white cells represent (presumably) the nurikabe walls. Try so solve the puzzle and don't be puzzled next time you lose your way in Japan!